At this time, some educators have a growing awareness of, and experience with, the personalized learning benefits of blogging. Increased relevancy, digital literacy, and conscientious effort for authentic audiences, are just three of many learning advantages that blogging can provide. Among the most powerful reasons for blogging is the opportunity to engage with communities of learners through social networks. Whether it's in the classroom, or as part of a learning community, cultivating relationships through social connection takes communication from merely the exchange of information to building empathy, understanding, and collaboration. One way to initiate and cultivate a learning relationship is by commenting on other educators' writing. Additionally, responding to comments is not only a nice thing to do, it also perpetuates the learning conversation and relationship. Social media tools such as Twitter, Blogger, and Google+ form the foundation of my personal learning network (PLN). Digital tools, mobile technology, and connected networks are fueling my personal learning in ways I never imagined. Specifically, blogging has stretched time and distance with respects to my learning relationships. Here are just a few recent examples of how "Nocking the Arrow" has helped make my learning world quite a bit smaller. After fifteen years, I was able to reconnect with Penny Potter, my mentor for National Board Certification. She had retired to a quite, private life in Missouri. It was through my posting of a tweet about a reflective blog post in which she was mentioned that we were able to reconnect and reminisce within the comments of the post. I shared this same post to the Professional Development learning community in Schoology. The post caught the eye of Giuseppe Pelosi, an educator in Italy. 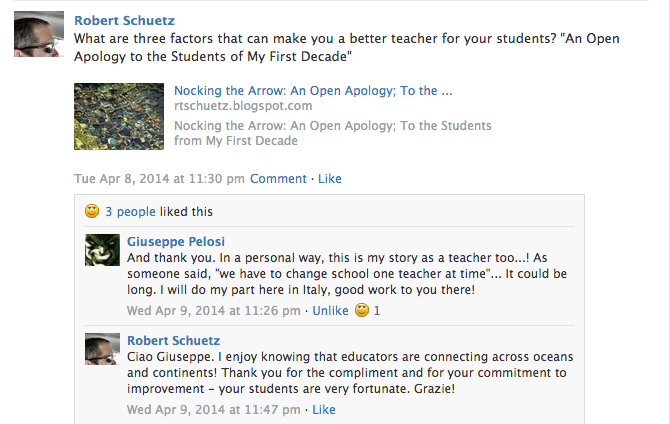 We were able to compare teaching experiences through the comment section of the community post. I am looking forward to learning more about life in Italy with Giuseppe's guidance. 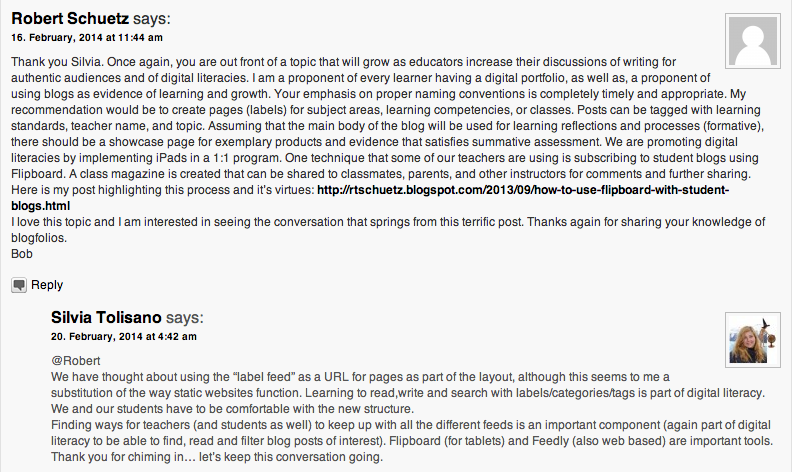 Several weeks ago, I was searching for information to help me build an argument for using blogs as digital portfolios. I didn't have to look much further than one of my favorite bloggers, Silvia Tolisano (Langwitches) who was describing her use of blogfolios (coined by Andrea Hernandez) with her students in Sao Paulo. I shared a compliment, and reached out to her for additional information. Silvia, Andrea, and I now connect regularly through blog comments and Twitter. 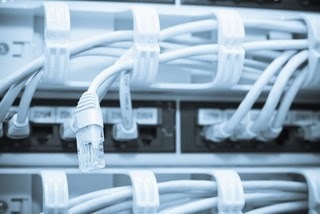 A couple of months ago, I wrote a post about a new term that I had picked up in my RSS feed. It was through this post about heutagogy that I was able to connect with Stewart Hase, an original contributor to research on this subject. 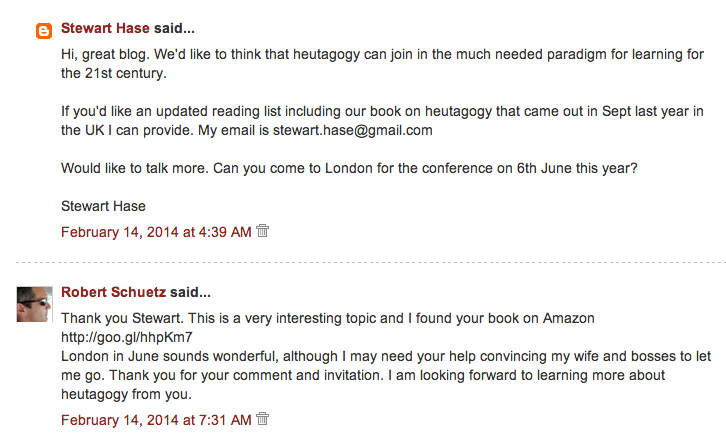 After reading my post, Stewart graciously invited me to World Heutagogy Conference. Although I can't attend the event, Stewart recently contacted me from Australia about contributing to a collaborative writing project. All of these opportunities to relate were made possible through the comments section of our blogs. Comments turn a transaction into a conversation. Once again, empathy, understanding, and collaboration enrich the learning process. A valuable way to engage with your personal learning network is to write comments on blogs that you find interesting or helpful. Respectfully disagreeing with the message is another way that learning can be shaped through written conversation. Blogging can be a powerful learning activity, and as most bloggers will tell you, it is often that what follows in the comments section that provides the most value to the readers and to the writer. You can contribute to deeper and more meaningful learning, as well as, create powerful learning connections by posting comments to your favorite blog posts. Literally, we're on the same page! This is the power of the web. And, surely, I'm very curious about other school systems, because I think I can learn something from better systems, but also I can find out that mine is not always the worst... There could be something good also here in this strange country... And if we get very well the point of blogging comments between educators, we can also understand the potential of an international blog for students! Well, my pupils may be not so confident with their english, but... We can work it out! Thank you.